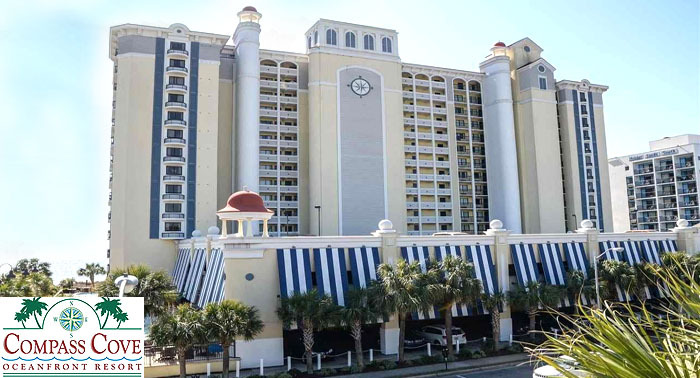 The Compass Cove Oceanfront Resort in Myrtle Beach is a sprawling, almost all-inclusive vacation retreat on the south end of Myrtle Beach with 530 condos located in 3 buildings. Very convenient to Market Common and the old Air Force Base, rentals are plentiful and families have returned for years. Compass Cove was converted to luxury condominiums back during the condo rush in early 2004-2005, and now consists of three beautiful towers, each with its own set of water amenities and special attributes. The Pinnacle Tower has suites, efficiencies, and penthouses with great views, and the pools are located at ground level. Boasting indoor and outdoor pools, lazy rivers, jacuzzis, and a special kiddie attraction, this is the place for families with children. During the summer, live bands play at the Crow's Nest Lounge by the pool. The Mariner Tower is a 15 story complex with larger condominiums, including 1, 2 and 3 bedroom units. Wide and long, there are many oceanfront condos and the lesser number of side rooms still have perfect views down the beach. The two and three bedroom units have 2 full bathrooms and full kitchens, as well as extra space in the living room area for larger families to relax. This tower has a parking garage and fitness center along with its own pools. The Schooner Building is a low-rise, four-story addition that has smaller units and efficiencies. The most low-priced of the three, it still has the major water amenities - indoor/outdoor pools, lazy rivers and jacuzzis, kiddie pools, a tiki bar, gameroom, conference room, and breakfast restaurant. The oceanfront condos in this building are great for rental income and families with small children. The off-season will offer an economic vacation for golfers, with many of the best courses located south of the main drag in Myrtle Beach, and in Surfside or Murrells Inlet. You'll find condos both oceanfront and ocean view, with 1 bedroom units in all but the North Tower, which has 2 or 3 bedrooms that are priced in the mid $200,000's to $300,000. One bedroom units are priced around $100,000, with a few efficiency units priced in the $80,000 range. The Schooner Building offers oceanfront units that are low-rise, only 4 floors instead of the many-floored towers. No matter which building, owners and guests are virtually guaranteed to feel right at home at this beautiful luxury resort. If you're looking for a vacation condo or an investment property, Compass Cove Resort in Myrtle Beach is one of the most popular, enjoying packed rentals all summer long. We'll be glad to take you by and show you around the resort. We're here to point out the pros and cons of all the Myrtle Beach condos so you can decide on the perfect one to fit your special needs. Just give us a call for information! Compass Cove Pinnacle Oceanfro Bldg.